We welcome guest bloggers! 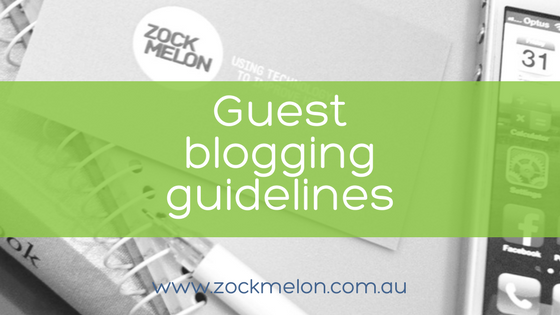 Check out our guest blogging guidelines if you would like to be featured on the Zockmelon blog. All blog posts are clearly attributed to the author, yourself, as the guest blogger. Blogs posts are unpaid and you own the intellectual property of that post, and are free to re-publish elsewhere including LinkedIn Pulse, professional publications or your own blogging platform. If you are publishing elsewhere after you have first published on www.zockmelon.com.au please cite the source of the original post by using a hyperlink to your guest blog. Remember that this is a blog not a peer reviewed journal article. Please don’t include references (but you can hyperlink if needed to other websites). The tone should be conversational, professional, easy to read, and generally positive and helpful. Please give your blog an interesting and descriptive heading. Please use subheadings to break up your writing. If possible, please provide an image. You MUST have copyright of all supplied images and have not save an image from a google search. Where possible, take a photo yourself or provide a link to a suitable creative commons image e.g. via Flickr. Word count isn’t important, your blog may be anywhere between 500-2000 words, but this is just a guide, not a rule. All blog posts will be edited by myself, Kristy Schirmer, and I reserve the right not to publish or remove it from my website at any time. Edits will be shown to you for approval, and that we may edit all copy including the headings, subheadings, images and main text. This is done in order to make your blog the best it can be for readers, and also with Search Engine Optimisation (SEO) in mind, so Google can help readers find your writing. Blog posts on the Zockmelon website are open for comments. These comments will be moderated and responded to by Kristy Schirmer. If there are specific comments that you may wish to reply to I will let you know. We encourage you to share your post when published with your networks e.g. through Twitter, LinkedIn or email. We also welcome submissions from Undergraduate and Postgraduate students in Health Sciences, Health Promotion or related areas. This is a good opportunity to have your research and ideas seen by a wider audience and grow your online professional identity. Please note that Zockmelon is not responsible for who may share or comment on your blog post. Submitting your blog is done so with the understanding and agreement of the above guidelines. If you would like to discuss submitting a guest blog, please make contact via email or through our contact form. Does your blog suit the target reader for the site? Does it have a catchy heading? Has your blog post been proof read well for readability, typos and grammar? Does your blog have clear take home messages or calls to action? Have you provided an image/s associated with your blog post that you have the copyright to, or have you provided links to suitable Flickr/Creative Commons images? Do you guarantee that your blog post is your own work and intellectual property? Have you sent your blog post in a MS Word file or via Google Docs using a common font type? Download the Guest Blogging Guidelines here.